The Facts On File Dictionary of Music provides in-depth explanations and examples of more than 3,000 musical terms and topics, including biographies of composers. Covering all major subjects, from technique and musical styles to instruments and notation to history and much more, the dictionary is an authoritative reference. It offers accessible coverage of a wide range of music-related subjects, from early history up to the present day, and is enhanced with more than 250 illustrations. 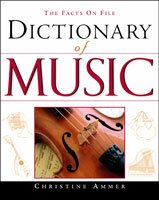 An ideal resource for quick, basic reference, The Facts On File Dictionary of Music is set apart from other music references by its crystal-clear explanations of musical terms, excellent illustrations of instruments, repertory for the various instruments, pronunciations of foreign terms and composers, and inclusion of carefully constructed charts presenting additional information on principal ballets, operas, symphonies, and more. A valuable tool for students, teachers, professionals, and music lovers alike, this greatly expanded and thoroughly revised version improves on acclaimed earlier editions, which have been standard references for libraries since the 1970s. "...a significant volume...a friendly, easy-to-read style...this strong reference would make a wonderful addition to all school libraries. It would also make an ideal gift for the aspiring musician." "...a useful tool for quick, basic musical reference needs." "The entries provide excellent introductory material...Recommended." "...a good basic reference tool for collections in need of classical music resources." "...a very appropriate purchase for high-school or small public libraries."